Transparency Market Research (TMR) has published a new report titled, “Botulinum Toxin Market - Global Industry Analysis, Size, Share, Growth, Trends, and Forecast, 2018–2026”. According to the report, the global botulinum toxin market was valued at US$ 4,527.0 Mn in 2017 and is projected to reach US$ 8,718.7 Mn by 2026, expanding at a CAGR of 7.6% during the forecast period. Global increase in prevalence of spasticity and cervical dystonia and rise in the incidence rate of glabellar lines, crow’s foot, and facial wrinkles are driving the botulinum toxin market. Furthermore, continuously growing worldwide geriatric population and adoption of non-surgical aesthetic and therapeutics procedures are boosting the botulinum toxin market. North America is expected to dominate the global botulinum toxin market during the forecast period owing to the increasing awareness regarding noninvasive or minimally invasive, non-surgical aesthetic and therapeutics procedures. The market in Europe is projected to be a lucrative market for botulinum toxin due to the increasing demand for botulinum toxin procedures in the region. The market in Asia Pacific is expected to expand at a rapid pace owing to the increase in geriatric population and favorable government regulations regarding botulinum toxin procedures. The market in the region is projected to expand at a significant CAGR of 8.7% during the forecast period. Increase in the prevalence of spasticity & cervical dystonia and rise in the incidences of glabellar lines and facial wrinkles are key factors driving the global botulinum toxin market. According to American Association of Neurological Surgeons, globally, spasticity affects more than 12 million people worldwide. In the U.S., around 400,000 people are affected with some degree of spasticity related to cerebral palsy. According to Brain Foundation, in the U.S., rate of cervical dystonia is around 30 in 100,000 population. Prevalence of spasticity and cervical dystonia is increasing year-over-year, thereby increasing the demand for non-surgical therapeutics procedures, which in turn is driving the market. Consistent rise in the geriatric population worldwide is a major factor boosting the global botulinum toxin market. According to the United Nations, in 2017, the global geriatric population was 962 million, comprising around 13% of the global population and is expected to reach 2.1 billion in 2050. Surge in awareness regarding botulinum toxin procedure is fuelling the market. The botulinum toxin type A segment dominates the global botulinum toxin market. It is projected to account for 82% share of the market by 2026, expanding at a CAGR of 7.5 % during the forecast period. The segment is anticipated to reach a market value of US$ 7,153.5 Mn by 2026. Botulinum toxin type A is widely utilized in the treatment of cervical dystonia, spasticity, glabellar lines, and crow’s foot. In terms of application, the global botulinum toxin market has been segmented into aesthetic and therapeutics. Therapeutics is the leading segment of the market, and was valued at US$ 2,623.4 Mn in 2017. The segment is expected to reach a market value of US$ 4,819.4 Mn by 2026, expanding at a CAGR of 7.0% during the forecast period. Studies suggest that prevalence of glabellar lines, lateral canthal lines, crow’s foot, and facial wrinkles is common among the geriatric population, worldwide; thus increasing geriatric population is expected to propel the market during the forecast period. In terms of region, the global botulinum toxin market can be segmented into five major regions: North America, Europe, Asia Pacific, Latin America, and Middle East & Africa. North America dominated the global botulinum toxin market in 2017. In terms of revenue, the botulinum toxin market in North America was valued at US$ 2,558.4 Mn in 2017, owing to high prevalence glabellar lines, spasticity, cervical dystonia, crow’s foot, and facial wrinkles. The market in the region is expected to expand at a CAGR of 7.3% during the forecast period. The U.S. accounted for a major share of the botulinum toxin market in North America in 2017. The botulinum toxin market in the country is projected to expand at a CAGR of 7.4% during the forecast period. The therapeutics segment dominated the botulinum toxin market in North America in 2017. It is expected to expand at a CAGR of 6.7% during forecast period. The market in Asia Pacific is anticipated to expand rapidly at a CAGR of 8.7% during the forecast period, due to increasing geriatric population, comparative inexpensive procedure cost, and rise in the number of skilled professionals performing non-surgical botulinum toxin treatment. 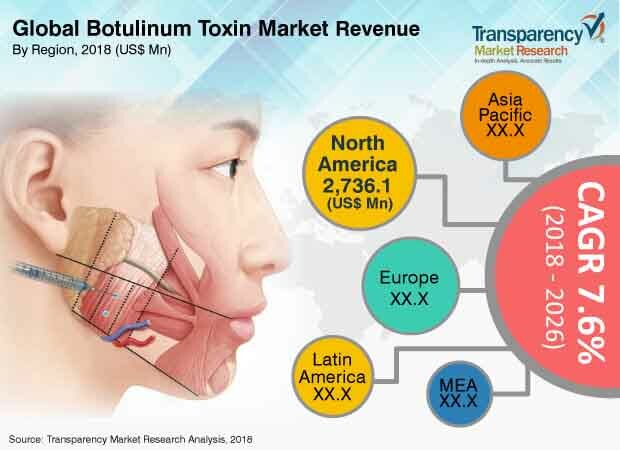 Key players operating in the global botulinum toxin market include Allergan, Inc., Ipsen Group, Merz Pharma GmbH & Co. KGaA, Medytox, Inc., US Worldmed, LLC, Galderma, Metabiologics, Inc. (US), Lanzhou Institute of Biological Products Co. Ltd., and Revance Therapeutics, Inc. Allergan, Inc., Ipsen Group, Merz Pharma GmbH & Co. KGaA were the dominant players in the market in 2017. They are expected to maintain their dominance during the forecast period. Robust marketing network and high-quality products have contributed to their leading position in the global market. Extensive research & development, geographic expansion in emerging markets and mergers & acquisitions are key strategies adopted by these leading players.